Deficits in social skills are often exhibited in individuals with comorbid Down syndrome (DS) and autism spectrum disorder (ASD), and there is a paucity of research to help guide intervention for this population. 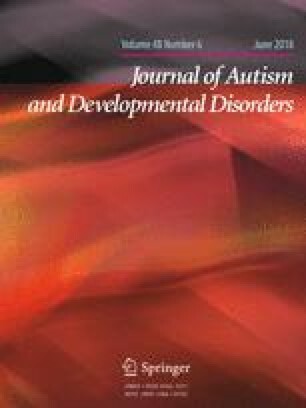 In the present study, a multiple probe study across behaviors, replicated across participants, assessed the effectiveness of peer-delivered simultaneous prompting in teaching socials skills to adults with DS–ASD using visual analysis techniques and Tau-U statistics to measure effect. Peer-mediators with DS and intellectual disability (ID) delivered simultaneous prompting sessions reliably (i.e., > 80% reliability) to teach social skills to adults with ID and a dual-diagnoses of DS–ASD with small (Tau Weighted = .55, 90% CI [.29, .82]) to medium effects (Tau Weighted = .75, 90% CI [.44, 1]). Statistical and visual analysis findings suggest a promising social skills intervention for individuals with DS–ASD as well as reliable delivery of simultaneous prompting procedures by individuals with DS. The online version of this article ( https://doi.org/10.1007/s10803-017-3437-1) contains supplementary material, which is available to authorized users. MACD—Conception and design of study, Data collection, Data analysis and interpretation, Drafting the article, critical revision of the article, final approval of the version to be published; AS—Data analysis and interpretation, drafting of article, revision of article; AR—Data analysis and collection; JC—Data analysis and interpretation, drafting the article, final approval of the version to be published. All procedures performed in studies involving human participants were in accordance with the ethical standards of the institutional and/or national research committee and with the 1964 Helsinki declaration and its later amendments or comparable ethical standards. This study received IRB approval from the University prior to research being conducted. Legal guardian consent and participant assent was also obtained. Centers for Disease Control and Prevention. (2015). Autism spectrum disorder (ASD): Data and statistics. Retrieved March 15, 2015 from http://www.cdc.gov/ncbddd/autism/data.html#references. Hartweger, J. (2014). This month’s topic: DS and autism dual diagnosis. Retrieved April 24, 2014 from http://dsagsl.org/enews/20140501enews.html. National Down Syndrome Society. (2012). Associated conditions. Retrieved March 15, 2015 from http://www.ndss.org/Resources/Health-Care/Associated-Conditions/. Vannest, K. J., Parker, R. I., & Gonen, O. (2011). Single Case Research: Web based calculators for SCR analysis. (Version 1.0) [Web-based application]. College Station, TX: Texas A&M University. Retrieved December 6, 2016, from http://www.singlecaseresearch.org/.